The 2018 edition for Challenge of the Americas closed out with Championship Sunday at Simraceway Performance Karting Center. The Sonoma, California area in which the famed circuit sits was forecasted to be hit with rain. The precipitation pushed later into the day then expected, coming in to effect the last two finals of the day to make it a very exciting end to the weekend and the series. Six of the seven Rok Cup USA championships were decided going into the day, with the seventh going down to the wire to award the drivers going to the 2018 Rok Cup International Final. The quickest driver throughout the weekend in Senior Rok was Hannah Greenemeier. The Colorado driver cleared the field by two tenths of a second in qualifying, and set the pace in the Prefinal. Michael Avansino (FA Kart) trailed Hannah throughout the 17-lap run, able to complete a last lap pass for the race win. The RPG / Kosmic driver put herself out front by a solid margin until the rain began to fall. She led the first 15 laps until spinning off course. That handed the lead to Avansino, who was able to tame the wet circuit on dry tires the best. As the race continued on, the precipitation went away and the track began drying with the strong winds. Jake Drew (PGR / Ricciardo) began running down Avansino for the lead. On the final circuit, Drew was there and looked for a way past. At the final turn, Drew dove to the inside of Avansino. The two made side by side contact under the wet conditions, with Avansino getting the worse of it, spinning around 360 degrees and making contact with the tire wall. Drew was able to drive to the line and grab his third victory of the series while Avansino continued to cross the line in second. Saturday winner Bijoy Garg (Exprit) ran a solid third. Greenemeier drove to fourth while Filip Niemkiewicz (Kart Republic) ended up fifth. Jim McKinney (FA Kart) clinched the championship on Saturday, suffering a stuck throttle during the Final to end up 12th. 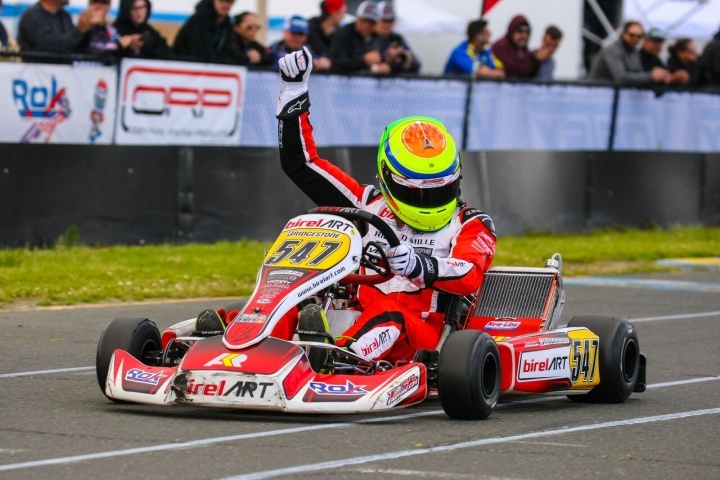 The Rok Shifter Senior division was a battle between provisional champion Alex Keyes (Birel ART) and Saturday winner Hunter Pickett (Aluminos). Keyes set fast lap in qualifying before Pickett scored the win in the Prefinal. The deciding factor was the holeshot, going to Keyes. The double CalSpeed winner led all 25 laps of the final with pressure from Pickett and Round Two winner Nicky Hays (Ricciardo). Enzo Prevost (Aluminos) was fourth with Cabot Bigham (Aluminos) fifth. Keyes secured the championship along with the Rok Cup International Final ticket, as Hays finished second in the standings ahead of Kol Bailey (Praga). Kevin Woods was again the driver to beat in the Rok Shifter Masters division on Sunday. Woods led until mechanical issues put him on the sidelines. This gave Patrick O’Neill (CRG) the opportunity to win a second main event on the weekend. Kalvin Chen (CRG) led for a bit, settling into second and scoring the series championship by just two points over third place finisher Nick Firestone (DR Kart). Jeff Smith (Tony Kart) and Michael Guasch (Formula K) completed the top-five. Ugo Ugochukwu (Tony Kart) made sure to stamp his championship in the Junior Rok division with a sweep of Round Six. Ugo set fast time in qualifying and then went back and forth with Austin Torgerson (Tony Kart) in the Prefinal. At the line, Ugo came away with the win by 56 thousandths of a second. It was nearly the same situation in the Final from Saturday, with Ashton Torgerson (Tony Kart) joining the fight. Ugo and Austin swapped the lead with Ugo dropping to third by the halfway point. He put himself into the second spot and was able to use fast laps of the race and lap traffic to run down Austin. Coming to the white flag, Ugo took over the lead with a deep move into turn seven. It caught Austin off guard, and Ugo ran away with the lead and the victory to clinch the championship. Austin and Ashton completed the podium with Nolan Siegel (Exprit) in fourth and Colin Queen (Ricciardo) placing fifth. Erik Jackson was another series champion to sweep the day, scoring his second victory and sixth straight podium in Masters Rok. Just 33 thousandths separated Jackson (Vemme Kart) and David Pergande (Tony Kart) in qualifying. Jackson led all 17 laps of the Prefinal to keep himself on the pole position for the Final. Nick De Graaf (Vemme Kart) challenged Jackson for the first 15 circuits with Jonathan Silva (CompKart) waiting in the wings. Jackson took the lead for good and held off a last charge by Silva to secure the victory and championship. Silva ended up second in the race and the championship with De Graaf in third. Pergande (Tony Kart) was off on the opening circuit, but raced his way to fourth by the checkered flag, just ahead of Mike Giles (Birel ART). The day was a wild one for the Mini Rok division. Provisional champion Chase Gardner (Vemme Kart) set fast time in qualifying but was edged out for the Prefinal win by nine tenths of a second by Logan Toke (Top Kart). Rain hit the area before the main event, putting all drivers on the Bridgestone wet tires. This provided the opportunity for Max Pankewitz (Tony Kart) to challenge for the win. Gardner challenge Pankewitz for the lead, but a spin cost him the opportunity to score the win in the wet. Toke stepped up late, making a charge until a spin of his own cost him his chance. Pankewitz reached the checkered flag first for the victory over Toke with Gardner placing third, earning the championship. Enzo Swan (Benik) ran fourth with AJ Zarcone (Nitro Kart) in fifth. Gage Jarvis (Benik) scored the win in the Micro Rok division over Nico Sarphati (Kosmic). Ashton Torgerson (Tony Kart) won the overall victory in the Briggs 206 race group, winning the Junior division. Brother Austin Torgerson (Tony Kart) won the Senior category, as the two ran 1-2 in the Final. Tuesday Calderwood (Tony Kart) was second with Cooper Becklin (Birel ART) in third for Junior while Justin Goerz (K&K) was second in Senior.